For all novice climbers and experienced trekkers, Island peak (6189m/20,305 ft.), also known as Imja Tse is the most popular trekking peak in Khumbu region of Nepal. For all novice climbers and experienced trekkers, Island peak is the perfect destination to be sought as it takes you into the heartlands of the Khumbu Valley, Everest Base Camp (5,364m (17,598ft) and Island peak itself. Island Peak climbing package is conducted in the UNESCO enlisted World Heritage Site, Sagarmatha National Park where you can experience the amazing Himalayan landscape, traditional Sherpa villages, friendly local people, Buddhist monasteries, Gumbas, Chortens and also the rare encounter of Himalayan Flora and Fauna. All meals (Breakfast, Lunch & Dinner) while trekking as indicated by the itinerary. All necessary paperwork and trekking and climbing related permits and fees like National Park Permit, TIMS, Island Peak climbing permit, etc. All costs of Nepalese staffs including their wages, insurance, food and accommodation, domestic flights, transportation and other related costs. International airfares to and from Nepal. Personal Extra expenses by member like Laundry fees, drinks, phone calls, shower, etc. Personal climbing gears and equipment. Services more than included in “Trip Includes” section. Welcome to Nepal, the Land of Himalayas! Upon your arrival our representative from Himalayan Traverse will welcome to you at the airport and take you to your respective hotel. As it is the first day, we will make you brief introduction on your trip and your guide/s too. At the evening we will host a welcome dinner offering typical Nepalese cuisine in one of the finest Nepalese Restaurants in Kathmandu. Overnight in Kathmandu Hotel. After breakfast in the morning we start a small sightseeing in Kathmandu in the three famous UNESCO World heritage enlisted sites: “Pashupatinath Temple” the biggest temple for Hindus, “Swayambhunath Stupa” also known as the monkey temple which is one of the famous religious stupa for Buddhists and “Boudhanath Stupa” the biggest Stupa in Nepal located in Kathmandu. After this short visit to religious sites we make early preparations for our trip and make sure everything is okay. Overnight in Kathmandu Hotel. Early in the morning we take short scenic mountain flight from Kathmandu to Lukla which will be about 35 minutes and we start our journey for Everest Base Camp. As we land on Tenzing Hillary Airport we hold on a bit in Lukla as the guides and porters manage the baggage. Then we head for Phakding, a small Sherpa village which take a walk of three or four hours. Overnight at Phakding. Today, after having our morning breakfast we start our hike. With Dudhkoshi river by our side we also make entrance to Sagarmatha National park. After a straight walk of 5 or 6 hours, we reach Namche Bazaar which is also known as the “Gateway to Mount Everest”. 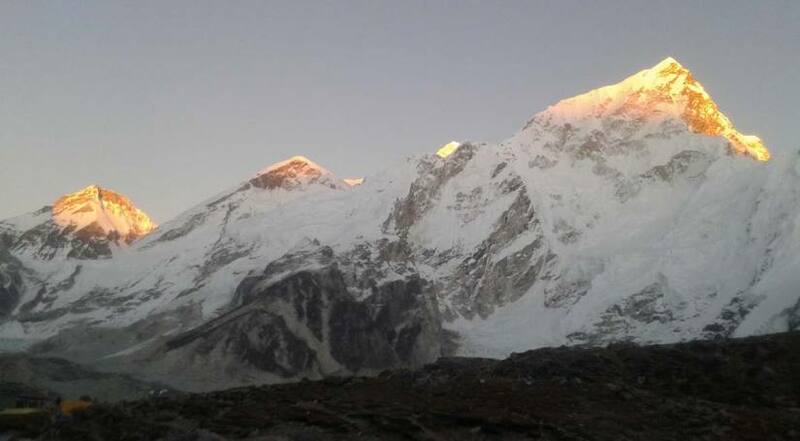 From there we can enjoy the amazing view of Mount Everest and Mount Lhotse. Overnight at Namche Bazaar. After a continuous walk to Namche Bazaar, today we make our day as an acclimatization day. Today we can for activities as per your wish. For example, a short hike to Khumjung or Everest View Hotel and enjoying the view of the mighty Himalayas can be a good option. We also experience the Sherpa culture and learn about Sherpa and mountaineering history by making a short visit to Sherpa museum and Khumjung School nearby. Overnight at Namche Bazaar. The day starts with a pleasant walk with the magnificent views if the Himlayas. We can see the high mountains such as Mount Everest, Mount Lhotse, Mount Nuptse, Mount Amadablam and Kongde all the way. Making our way through the rhododendron forests we finally reach our destination for today, Tyangboche. Rhododendron is also the national flower of Nepal. We also make our short visit to the largest monastery in the region by the name “Tyangboche Monastery”. Overnight at Tyangboche or Deboche. We start our day descending through the lush tree forest with the view of Mount Everest, Mount Amadablam and Mount Lhotse. As we move forward towards Imja Valley and up to Dingboche we can have the scenery of barley, buckwheat and potato fields on our way and also the “Pangboche Monastery” in Pangboche. Overnight at Dingboche. It’s an another acclimatization day in the village with fields of buckwheat, barley and potatoes. We can either take rest or make hike to Nagarhuna Hill and Chukkung nearby for some excellent views of Himalayas and the place. Overnight at Dingboche. Making our way through the Khumbu glaciers at the terminal moraine we climb up to Dugla. We can find the prayers flags and stones on our way up. We can see the clear views of peak like Khumbutse, Lingtren, Mahalangur himal and Pumori. 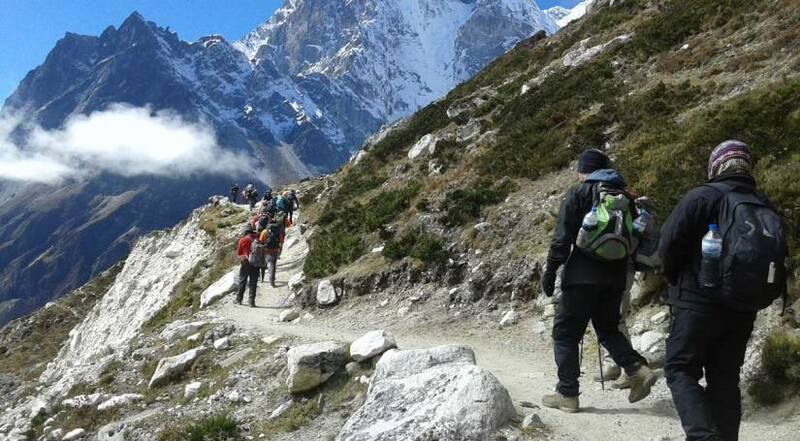 Gradually after a hike of 5 to 6 hours we reach Lobuche situated beneath the Lhotse Ridge. Overnight at Lobuche. 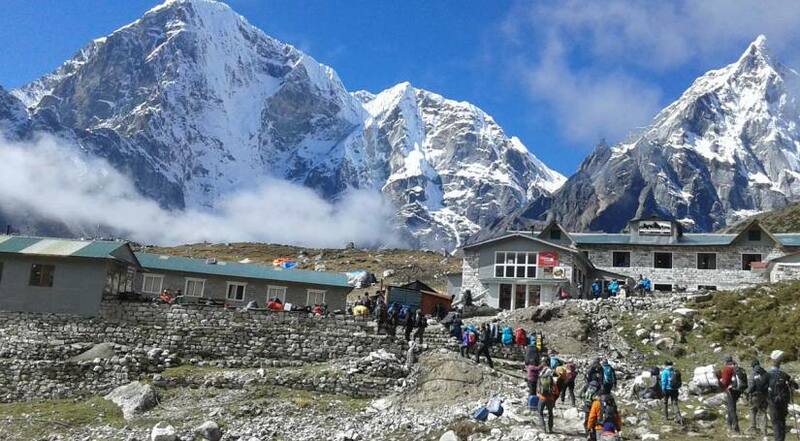 Today is as exciting day as we will be hiking for Everest Base Camp, our final destination. It definitely is going to be as amazing experience but a bit challenging too. We make our way to Gorak Shep first and head towards Everest Base Camp then following the Khumbu Glacier trails. On the way we can view mountains which are Nuptse, Pumori and Khumbutse and finally reach Everest Base Camp where we will be exploring today. For overnight we return to Gorakshep. We descend back to Namche Bazaar crossing the rhododendron forests. Enjoying the natural beauty of the place and watching the smiley faces of Sherpa locals we make our way down to Namche Bazaar. Overnight at Namche Bazaar. We head to Lukla today making our way through the Sherpa villages. We may take rest at places like Phakding and after a couple of hours we reach Lukla for the flight back to Kathmandu early in the morning tomorrow. Overnight at Lukla. As today we have to fly back to Kathmandu, we wake up early in the morning and make our early flight in Kathmandu. During the day you could take rest or buy yourself some souvenirs. On the occasion of our successful trip there will be a dinner conducted by us in the evening. Today we will be biding you farewell. We will be hoping that you will come back to Nepal again for another adventurous trip. We will take you to the International airport some hours before the scheduled flight and finally you will depart back for your homeland! You must bring the important documents mentioned below in your trip.